Great Northern Way Campus Trust (GNW Trust) was established by the academic shareholders (UBC, SFU, ECU and BCIT) to manage the lands, assets and income on behalf of the four institutions. Over the past 17 years GNW Trust has worked to realize the Shareholders' vision and transforming the former industrial property into a vibrant digital district which today includes the Centre for Digital Media buildings, a new Emily Carr University of Art + Design campus, mixed-use real estate developments, public open space, student residences, art galleries, and tech start-up space for industry professionals. Guided by the four Shareholders, a Board of Directors, advisory Committee’s and a dedicated management team, GNW Trust manages and operates real estate development and property management, financial and endowment management and supports the academic programs at the Centre for Digital Media, including the Master of Digital Media graduate degree program. 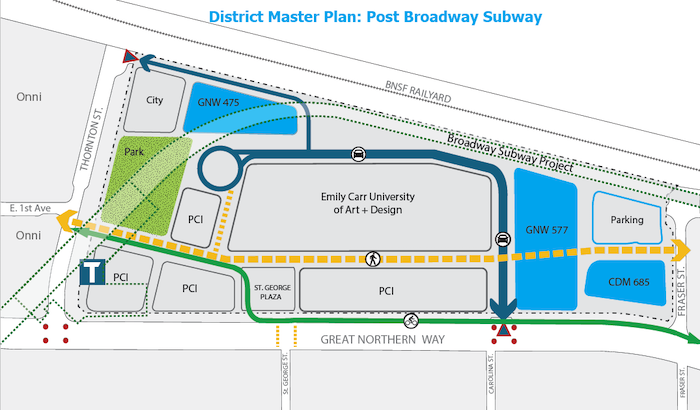 Development of the District will take place over two phases that align with the construction of the Provincial Broadway Subway Project (a pre- and post-Subway phase). 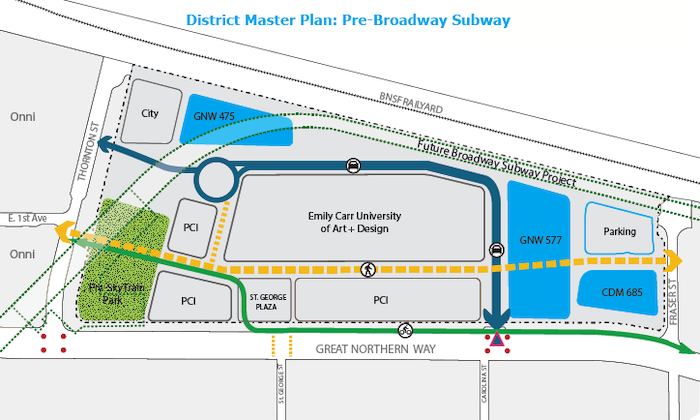 Currently the majority of pre-Subway sites have been developed with the second and final phase of development to be completed post-Subway construction (estimated 2025).